In the Oval Office, Luthor meets with the Senate Majority Leader.�He thinks about how easily he could remove this man, but he's in the mood for a little sport instead.�Luthor smiles as he thinks that politics is actually a fun sport. Lois and Clark hurry towards the arena, ready to see the rally for the mysterious new presidential candidate.�Moving inside, Clark says that all anyone knows him as is "The Candidate".�The lights dim down as a voice comes over the loudspeakers and the Candidate emerges on to the stage.�Amidst laser shows and explosions he tells the crowd that he has a new vision of America, and his message "We can achieve".�Clark just watches, unimpressed. 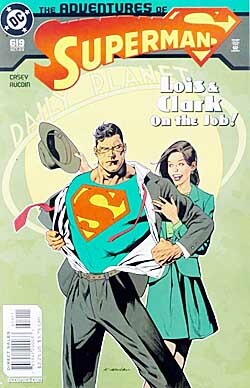 The next morning, Lois and Clark sit with Perry in his office and discuss the rally.�Perry guesses correctly that they both want to interview him.�He tells the couple that whoever brings him an interview first gets the interview.�As Lois agrees to this, Clark sees an emergency report on the television and quickly excuses himself. In deep space, a space station orbits around an alien world.�Inside the station two aliens make small talk around a bar.�One of them reads a passage to the other, and then puts the book away as red armor creeps up over his body.�He turns to his companion and says "Assassin Lad launch". Superman soars onto the scene in Cairo, where a gigantic finger is protruding from the skies, and devastating everything it comes into contact with.�Superman plunges straight into the attacker.�A mysterious voice immediately screams at him for interfering with destiny.�He is the god of the dead, and he will not be refused.�Superman gathers his strength and tells the god of the dead to meet the will to live.�With a burst of strength Superman destroys the hand. In the aftermath of their salvation, a group of children gather around Superman.�As he takes off into the sky a young boy asks an older man what just happened.�The man tells the boy that the Hand of Osiris has been legend for centuries and a solar cycle finally triggered its release.�However, Superman was there and in the battle of life versus death, life won. In Pittsburg the Candidate puts on the same show that he did in Metropolis.�Lois sits in the crowd scribbling notes.�Lois meets Clark in a nightclub for dinner.�They discuss their wager when suddenly a drunken man stumbles onto their table.�He tells them that everyone in the press corps is betting which will come first, the election or their divorce. Walking back to their hotel room, Lois tells Clark that they have to do this the old-fashioned way, without any super powers.�Clark agrees and the couple goes to sleep. After Clark is asleep, Lois quietly slips from the bed and dons a black jumpsuit and creeps into the Candidates offices.�Coming around a corner, she walks straight into a guard.�The man tells her to come with him.�Leading her into another room, she finds the Candidate sitting on the floor, meditating to a mantra of taxes and foreign aid.�His campaign manager heads her off and tells her that there are not to be any interviews.�The Candidate doesn't need to sell himself to the press, he is already the people's choice.�Suddenly the manager turns back to the Candidate and hurries away from Lois.�With his back turned, Lois quietly grabs his Palm Pilot from the tabletop and leaves. Returning to the hotel room, Lois finds Clark gone and a note sitting on her pillow.�Reading it, Clark says he knew that she'd be sneaky, and he had an emergency to take care of on the west coast. Reading through the Palm, Lois calls up a hacker acquaintance and asks him to hack into the security company for the candidate.�He tells Lois that a few weeks ago someone put out a hit on the Candidate. In New York, an expanding energy field scares a sleeping bum out of his alley.�When the glow vanishes Assassin Lad is standing there. First off, why is Lois still working at the Planet?�Don't get me wrong, I think having her work for Channel 6 is the worst idea since a new Supergirl, but this is being handled horribly.�Eddie, you can't let one writer make a major change and then have the other two just cover it up with a passing reference and a cheap excuse about working part time.�This doesn't jive at all with Lois' attitude over in Superman.�This whole quitting thing is being handled very poorly. Secondly, why is Casey injecting every issue with a brief emergency where Superman saves the world.�Two issues ago we saw Superman save the universe from some energy field before the Mxy twins attacked.�This issue we see two pages of him battling the Hand of Osiris.�What?�Excuse me?�What is going on here?�Why is the Hand of Osiris appearing in our comics?�This whole portion just so Casey could tell us that Superman represents life and he triumphs over death.�That's really deep.�I like little bits where Superman might stop a forest fire or save a falling man, but he shouldn't be saving the world from bogus threats every issue. Finally, why are we reading a story with "The Candidate" and "Assassin Lad"?�Metallo, Toyman, Prankster, Luthor, Brainiac, and a few dozen other potentials and we see Assassin Lad versus the Candidate?�Right.�I rest my case on that matter. Art - 3: Average stuff.�I like his Lois, and Assassin Lad looks pretty cool too (even if he isn't, at all).�Clark looks good too, but I really don't like his Superman.�On page 13 he doesn't even have the symbol, just a red pentagon. Cover Art - 2: I actually don't mind this cover that much.�It applies to the issue somewhat, and the Planet in the background is appropriate.�Superman doesn't look that bad either, except for his eyes which could be a little more defined.�However, and this is a really really big however, LOIS.�She looks horrible.�I'm not sure what that expression is, but it's definitely not one that should be on the cover of my comic books.�There has got to be a better artist DC could tap to do these covers.